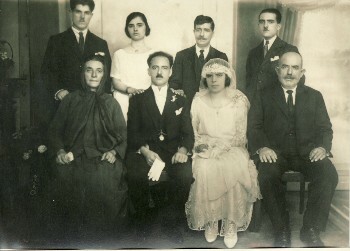 Above: At her wedding in Alexandria, Egypt. Standing are: Emmanouil Moutzouris; Irini Andonara and her father, Stylianos; and her brother, Emmanouil. 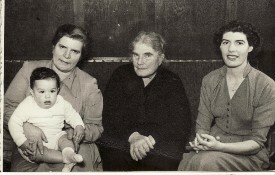 In the front row are: her mother-in-law, Irini Mastrogeorgiou; her husband, Georgios; Hariklia herself; and her father, Panagiotis. 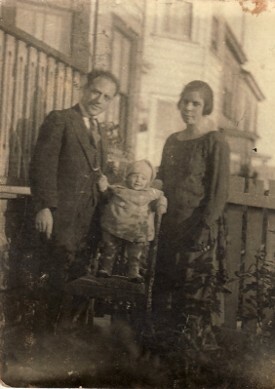 Above: With her husband, Georgios, and their daughter, Barbara. 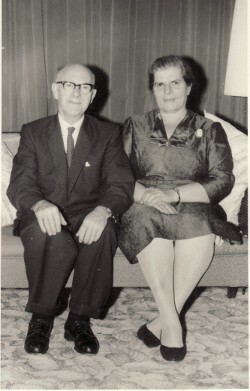 Above Right: With her husband, Georgios. Above: With her mother, Barbara; and her daughter, Barbara. Hariklia is holding her grandson, Mihail. Above Right: Celebrating her 50th Wedding Anniversary with her husband and children. 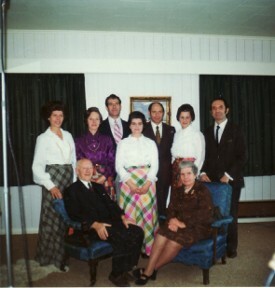 Standing are their children, Barbara, Irini, Stylianos, Panagiotitsa, Panagiotis, Persephone and Dimitrios, while seated are her husband, Georgios, and Hariklia herself.